When thinking about purchasing a second hand car there are many things that you should check to make sure you are getting a reliable vehicle - below is a checklist of what to check look at, but remember for a more accurate evaluation of the vehicle have your friendly mechanic at Advanced mobile tune look at it for you at our workshop or at the sellers premises. variations in the paint colour, loose panels or panels that don�t appear to fit properly. Check the inside of the boot, the bottom of the doors under the carpet and the floor wells for rust scale or perforations, which are signs of advanced rust. the rubber seals are in place and are in good condition. Look for over spraying which is a sign of a potential poor repair. Chips, dents and scratches are more signs of poor general care. 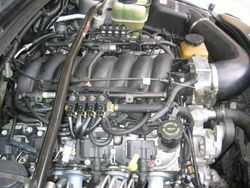 engine bay. Some later model vehicles have the compliance plate attached to the boot floor panel. 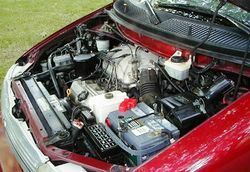 A dirty engine is a sign the car has not been well maintained and may indicate a mechanical problem. colour again after the engine has been running. A thick oil build up is a sign the car is lacking in maintenance. Ensure the engine starts easily without hard revving. Lift the bonnet and listen to the engine idle. The sound should be even with no unusual noises (knocking, rattling, etc). Check the exhaust smoke; blue smoke can signify serious problems. Check for damage or corrosion. Even worse, check for signs of leakage. The coolant should be clean and brightly coloured. The battery should be held securely in place and the battery terminals should be secure and clean. Check for acid corrosion. Excessive noise or fumes may indicate holes or rust in the muffler or pipes. Check all tyres for tread, cracks and uneven wear, which can indicate problems with the steering or suspension. Include the spare tyre in your inspection. Check the engine, transmission, differential, brakes, power steering and the shock absorbers for any signs of a leakage. Check throughout for wear and tear. Remember to look under mats and seat covers. Check the seat belts are in good condition, not frayed or faded, and that they are well anchored. Ensure all lights illuminate when they should, both on the dashboard and outside the car. Make sure they are included and are in a workable condition. Make sure the pedal feels firm on application. When braking, the steering wheel should not vibrate and the car should stop smoothly in a straight line and not pull to one side. Relax your grip on the steering wheel and see if the car pulls to one side as this can indicate either worn suspension or misaligned steering. Listen for any rattling or knocking noises when you accelerate, decelerate or are cruising. Unusual noises may indicate excessive wear. Blue smoke can signify serious problems. Listen for any unusual noises particularly when you drive over bumps. Check the gears change easily (both in manual and automatics) without any abnormal �whining� or �howling� noises.